In my previous post, I broke down the Facebook EdgeRank algorithm – the formula Facebook uses to determine what populates your News Feed. To quickly recap, EdgeRank takes three factors into consideration: affinity score, edge weight, and time decay. Affinity score assesses how connected you are with others, edge weight measures how engaging your content is, and time decay determines the relevance of your post in terms of time. For businesses, these factors tell you that you need to connect with your followers, post engaging content, and post frequently. It takes effort to make sure you are covering all of your EdgeRank bases. Here are five simple tips that will hopefully help make these tasks a little less overwhelming. One of the most common ways to get people to engage with your posts is to ask a question. This helps to start a conversation and gets people interacting with both your page and each other. Make sure that you participate too! If someone takes the time to answer your question, then take the time to respond. In the example below, San Diego State University asked it’s followers what their favorite building on campus is, resulting in 1 share, 38 likes, and 98 comments! Most of the time, it’s best to be straight-up and tell your audience what you want. 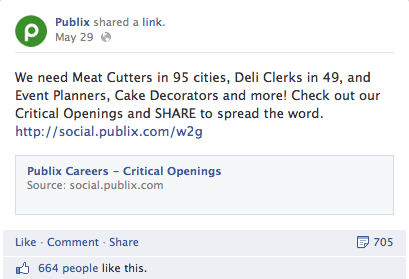 If you want them to show their support for your new product line, then literally say, “Like this if you’re excited about our new summer shoes!” In the example below, Publix, a grocery store chain, lets followers know about job openings and asks them to share the post, resulting in 705 shares. As I discussed in my previous post, images are considered to be more engaging than a post with text only. When you are typing up a post to send out to your followers, stop and add an image before you hit Publish! Even better, post a branded image. This will help to increase brand recognition and is a simple way to insure that people do not save your images and re-use them on their own pages. 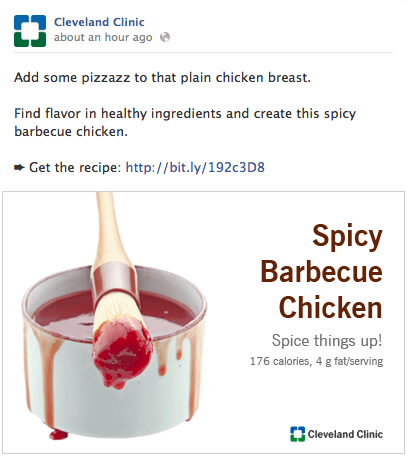 One organization that does an amazing job at posting a branded image with every post is the Cleveland Clinic – see a few examples below. Photo albums are a simple way to allow people to get to know your brand and engage. If you have a brick-and-mortar, it can be something as simple as a tour of your store or office. Other ideas include a Meet the Team album, photos from a recent team outing or a convention that someone at your company attended, or photos from a recent catalog that you just sent out. Do you have any simple Facebook engagement tips? Or have you done any of the above and found success with engaging fans? 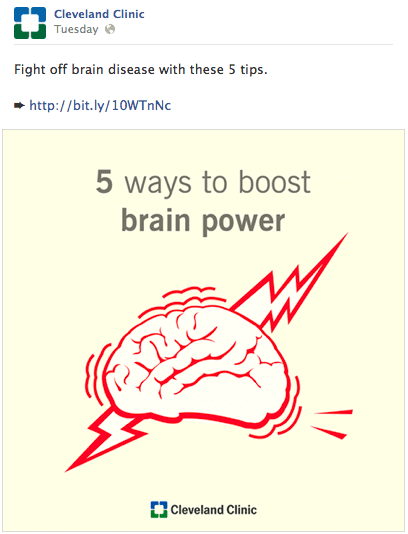 The five tips above are a great starting point for running a Facebook page. If you want to step it up a notch, look into running contests or adding apps to your Facebook page such as Pinterest or Instagram. 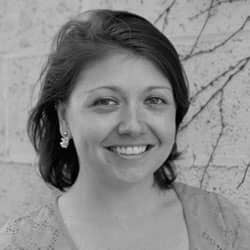 I'd love to hear about your FACEBOOK ENGAGEMENT TIPS that have worked great but did not require a huge time investment. Please share your experiences in the comment section below!